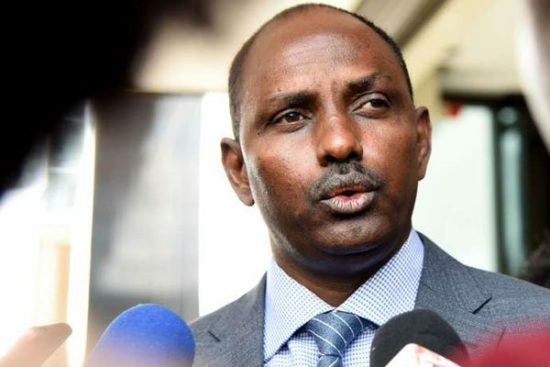 Labour CS Ukur Yattani has urged nurses to call off their strike, which is ongoing in select Counties countrywide in order to pave the way for negotiations. Speaking when he introduced the conciliation committee, led by Haron Mwaura, set to lead the talks, and other bodies involved in the negotiations including the representation from the Council of Governors, Yattani noted that the strike notice will directly affect the nation, especially coming at a time when the government is in the implementation phase of the Universal Healthcare coverage, “It’s not desirous for the general public in any way,” he said. The Labour CS said he has full confidence in the conciliation committee, and requested all negotiating parties before the committee to cooperate and to give their views in a transparent manner. “The welfare and the lives of the people of this country should be supreme, we don’t operate in isolation, we operate within the bigger society, people are dying in hospitals, they are going without services…some of them are your own relatives, your own family members, your own children,” he said. He said as a result of the commencement of talks, nurses should call off their strike, saying if the industrial action persists during talks, it’s a breach of the law and they’ll be cited for contempt, and could also lead to adverse effects including withholding salaries and loss of jobs. However, speaking in Eldoret after the Labour CS remarks, Kenya National Union of Nurses (KNUN) Secretary General Seth Panyako said the CS is incompetent, and that they served him the strike notice in November, and didn’t allow the existence of a conciliation team to hold talks back then, adding that he had all the time to react but has made his presence known late. Panyako has affirmed that the strike will proceed in the designated Counties, and what is happening now is just the tip of the iceberg. “Ukur Yattani has demonstrated his inability to run that Ministry, he is very incompetent and should be fired. He must know the issues of workers cannot be militarized,” he said. He added that he can’t yield to threats of facing the law if the strike isn’t called off, and they’re ready to face the Labour CS. Panyako last week noted that County governments had failed to honour the agreements reached between nurses and the two levels of government on 2nd November 2017 and that nurses would withdraw services in starting Monday in Nairobi, Kwale, Kirinyaga, Mandera, Embu, Nyandarua, Kiambu, Garissa, Nyeri, Samburu, Elgeyo Marakwet, Trans Nzoia, Tharaka Nithi, West Pokot, Wajir, Homa Bay, Murang’a, Taita Taveta, Kisumu, Kisii, Nairobi and Kitui. Three governments had settled the allowances and won’t be affected, Machakos, Migori and Mombasa. Other Counties had given assurance that they’ll pay the required money, and they include Bomet, Baringo, Bungoma, Busia, Isiolo, Kajiado, Kakamega, Kericho, Kilifi, Lamu, Laikipia, Meru, Nakuru, Nandi, Narok, Siaya, Makueni, Turkana, Nyamira, Uasin Gishu.